As one of the "few outstanding formations of their kind" (Basler Zeitung), the Eos Guitar Quartet has been casting a spell over their fans for over 25 years. With seven CDs, programmes full of variety and too many concerts to count, the four guitarists from Switzerland have won the respect and enthusiasm of critics. Whether it's classical, jazz, rock, modern avant-garde or flamenco – the Eos Guitar Quartet is comfortable playing in many styles. Even the Spanish audience – with the highest demands when it comes to guitar music – were convinced, thanks to the collaboration with the famous flamenco singer Carmen Linares. Invitations to international festivals such as Córdoba, the Menuhin Festival in Gstaad, Bari in Italy or to Germany's Ludwigsburg Festival underline the significance of the quartet. Since 2011, the Eos Guitar Quartet have also been working as event organisers themselves. In collaboration with the Casinotheater Winterthur, the IN GUITAR Festival attracts a large audience every year. 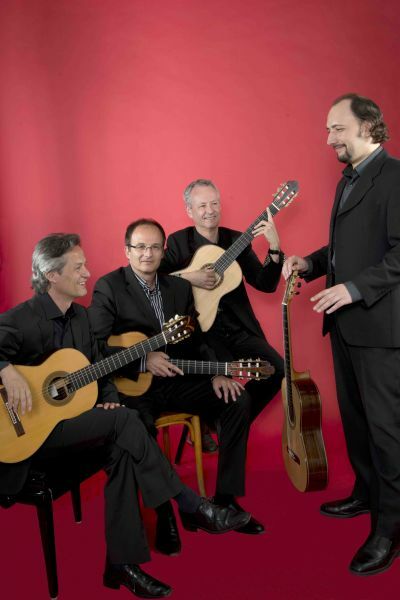 Two factors are a considerable part of the enduring success of the Eos Guitar Quartet: their inspiring programme and the equality between the players in the quartet. No-one is just a soloist. Everyone pays attention to the others in a lively exchange when they make music. This is clear to see and hear at every concert. Time and again, the Eos guitarists have also worked hard at their desks. Their arrangements broaden the range of music for four guitars with a sense of preciousness and value: Federico Garcia Lorca's Spanish folk melodies and songs, George Bizet's Carmen suite, as well as the guitarists' own compositions and, last but not least, commissioned works. Guitar luminaries such as Leo Brouwer, John McLaughlin, Ralph Towner, Sergio Assad and Roland Dyens – to name but a few – have composed original works for the Eos Guitar Quartet. Marcel Ege, Martin Pirktl, David Sautter and Michael Winkler got to know each other when they studied together at the Music Academy in Zurich. They founded the quartet in 1988, taking their name from the Greek word for dawn. Master classes with notable artists at home and abroad as well as initial successes with the public and the press made the four of them a close-knit unit. Appearances on radio and television saw their success continue. One highlight in the history of the Eos Guitar Quartet was the sold-out performance at the St. Jakobsstadion in Basel on 4 July 1992. Elton John and Eric Clapton desperately needed a support act at the Open Air concert in front of 50,000 spectators. Eos made the snap decision to travel from Spain, and rocked the 'Joggeli' arena with Luigi Boccherini's 'Fandango'. At the IN GUITAR Festival 2013 in Winterthur, there was another emotionally charged moment in the history of the quartet. Co-founder Martin Pirktl played with the group for the last time and, for the last piece of the evening, gave up his seat to a new member – the young Argentinian Julio Azcano.